The first thing you'll notice about this dilemma is that personnel cannot gain skills while facing it. That means that if you can filter out enough personnel, then it has a good chance of working. What is the first space dilemma to filter out personnel that comes to mind? Is it Personal Duty? 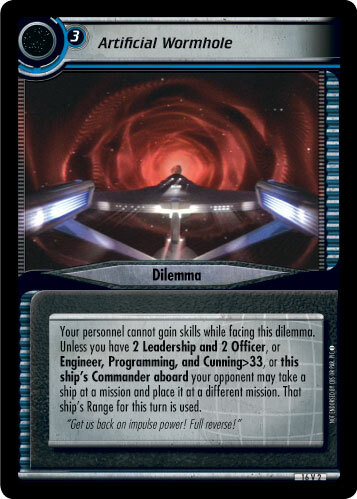 This one dilemma will often be enough to guarantee that Artificial Wormhole takes a ship for a ride, because it will filter out personnel for each of the three different requirements. By stopping all but one personnel with Leadership or Officer, the first requirements will be failed, because there are currently no personnel in the game with 2 Leadership and 2 Officer. Simply stopping a couple of personnel will lower the remaining personnel's Cunning, so the second requirements should be failed (depending on who is actually attempting, obviously.) That just leaves the third requirement, and that probably won't be much use either. After Favor the Bold releases, the percentage of personnel with the Commander keyword who have either Leadership or Officer will stand at 91%. That means that the corresponding Commander has every chance of being stopped by Personal Duty as well. Once your opponent fails to overcome the dilemma, you have a choice of which ship to move. The dilemma states that you can move "a ship." This is not limited to your opponent's ships, it includes yours as well. Now you can add the Phoenix (Risen From the Ashes) to your deck without having to waste deck space on cards to move it from your headquarters mission. Dominion players could use it to move the Tenak'talar (Weyoun's Warship) to the mission for the possibility of scoring 10 points when the mission is failed. Romulan players could make sure an Intelligence personnel is at the mission to take advantage of Secret Conspiracy. You could even use it to move a Cloaking Device ship to the mission for use with Once More Unto the Breach. If none of these ideas appeal to you, you could just try to strand your opponent's ship instead. The dilemma states you can move a ship to "a different mission." That is any mission in the game. If your deck can afford to have a couple of missions in different quadrants, you could add something like Assault on Species 8472 (in the Delta quadrant) and Chart Stellar Cluster (in the Gamma quadrant). Both missions have four span, and will require eight Range to move from them to a headquarters mission in a different quadrant (excluding Deep Space 9 and Terok Nor.) If you add a couple of copies of Precise Attack into your deck, you could move your opponent's ship to a different quadrant, and then reduce their Range with an engagement. Unless your opponent's ship started with ten or more Range, that will leave them stranded. Are you nostalgic for First Edition yet?